The view from I-link Town Ichikawa on the 45th floor on the very tall building named 'The Towers West' at the south gate of Ichikawa Station is excitingly spectacular. The Observatory on I-link Town Ichikawa is one of the closest observatories command a panoramic view of Tokyo in between Narita International Airport and Tokyo or Haneda International Airport. 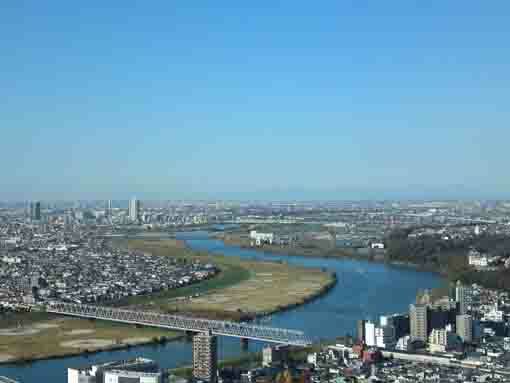 Looking toward Tokyo to south and east, wide dry riverbeds of Edogawa River spread under the observatory so there are no tall buildings in both direction near it, visitors could see Mt. Fuji standing behind skyscrapers in Tokyo. In windy days in January, the view of Mt. Fuji from it is amazingly beautiful. In north, visitors could see Mt. Tsukuba from it. Moreover, the observatory on I-link Town Ichikawa could command Mt. Fuji and Tokyo Skytree simultaneously. In addition, visitors could enjoy seeing the night views of the Big City Tokyo from the observatory. Why don't you visit the observatory on I-link Town Ichikawa? 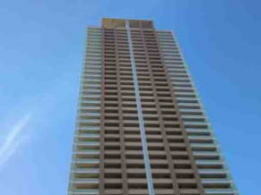 The Observatory of I-link Town Ichikawa is on the 45th floor of the Towers West standing in front of the south gate of Ichikawa Station. Visitors could enjoy getting a bird's-eye view of Tokyo and Mt. 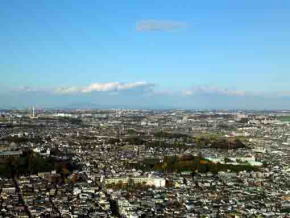 Fuji from the heights of 150 meters. The observatory is a great view spot that command panoramic views of Tokyo Bay and Boso Peninsula in south, Mt. 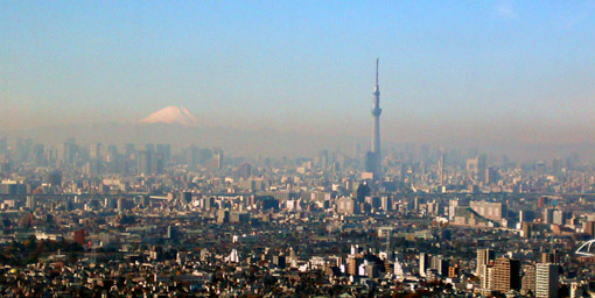 Fuji behind Tokyo Skytree and skyscrapers in Roppongi and Shijuku in west and Mt. Tsukuba in Kanto Plain in north. 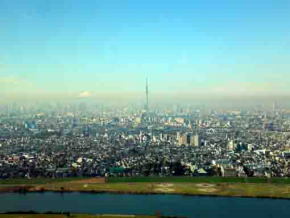 Visitors could enjoy seeing the panoramic view of Tokyo Metropolis in fine day, especially the silhouetted rouge Mt. Fuji in the evening and the night views of Tokyo. There are a lobby, a lounge, an information, a cafe and a deck in the observatory. Visitors could get some special information and products of Ichikawa city at the information, and events are held at the lounge. The observatory of I-link Town Ichikawa opens from 9:00 to 22:00. (The deck closes at 21:00.) And it is closed the first Monday in every month. The Observatory of I-link Town Ichikawa has great accessibilities from both Narita and Haneda International Airport. From Narita International Airport, take Sobu Express Line bound to Tokyo or Yokosuka and get off at Ichikawa Sta. Or take Keisei-line bound to Ueno and get off Funabashi Sta,transfer the line to JR Sobu line and get off Ichikawa Sta. From Haneda International Airport, take Keikyu-line bound to Narita, and get off Shinagawa Sta and transfer the line to Sobu Express line bound to Narita International Airport or Chiba, and get off Ichikawa Sta. Take 0 minute walk from Ichikawa Sta, it is on the south gate of the station. From Akihabara Station, take Sobu line bound to Nishi Funabashi, Tsudanuma or Chiba and get off Ichikawa Sta. It takes only 25 minutes. It command a panoramic view of Mt.Fuji behind Tokyo.